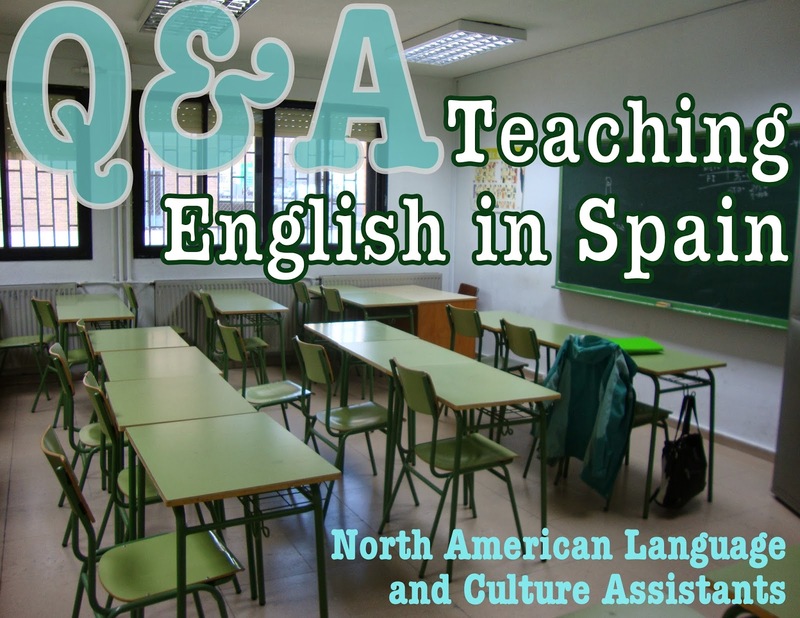 A few weeks ago I got an email with questions from someone interested in working as an auxiliar de conversación (North American Language and Culture Assistant) in Spain next year. In case others have similar questions, I thought it might be useful to post the questions and my responses here. 1. Looking back on your overall experience, are you glad you decided to spend 8-9 months in Spain? Was the decision worth it? Without a doubt, yes. I am so glad I went back to Spain for another year. Some of the people I met during my year as an auxiliar became my best friends --and are still to this day. 2. What was your biggest reason for participating in the Auxiliares program? a. A desire to teach English abroad. b. A desire to improve your Spanish language fluency by living abroad. c. A general desire to travel and live abroad. d. Or some other reason. I had studied abroad in Madrid my junior year of college and loved it. I actually thought I would be serving in Peace Corps (PC) after I graduated college, but when I randomly got accepted late into auxiliares (and my PC health exam didn't pass) I decided to go to Spain. Reasons being: To live in Madrid for the Spanish language, the sunshine, the relaxed lifestyle, to make new friends, and to have new experiences. I was also really excited to be teaching instead of studying like last time, so I would have more free time instead of needing to study and write papers. 3. What was the best part of your English teaching experience in your school? The best part for me was getting to know the students. I was at two public vocational schools, so my students were ages 16 - 40. Many were around my age in their early 20s. Sometimes that felt strange, but they were all really nice and I learned more about Spanish culture through conversation with them. I actually became friends with some, and hung out outside of class a couple of times. 4. What was the worst part of your English teaching experience in your school? 5. What advice can you give to a future Auxiliar about having a positive teaching experience? Please keep in mind that your teaching experience completely depends on the school(s) you're placed in and the English teachers. Unfortunately you won't know until you get there how it will be -- but don't let that stop you! I was placed in two (poorer) vocational schools, and it was the first year that both of them had an auxiliar. So they didn't really know how to best use me. It's not like it was a bad experience - I didn't dread going to work or anything, I just uh, felt useless/powerless most of the time, which is a shame because I thought I had a lot to offer with my experience/knowledge of learning/teaching foreign languages. Other auxiliares were a lot busier than me, and a lot more involved in their classes/school. Some schools are wealthier and have more materials than others. One of my auxiliar friends got to go on a school trip to the UK with her students during the year! Again, you won't know until you get there, but either way you can make the best of your situation and have a great year. Since my work as an auxiliar wasn't very fulfilling to me, I made sure that the rest of my time was. Work is only 16 hours a week, so I put my energy and dedication into my private English classes - where I did have control over the format of class. I felt useful there! I also joined an ultimate frisbee team and spent multiple nights each week and nearly all weekends with them at practices and away at tournaments. That's where I made my best friends and have the best memories. 6. Whom did you end up living with? Americans? Spaniards? People of other nationalities? And was it a good experience? 7. Did you teach private English lessons or have any other side jobs? Yes, I taught private English classes and I really enjoyed them. I charged 16/hr for all of my classes but one (15/hr for a student I had taught when I studied abroad -- we left it at the same price as before. I adore this kid and his family, so I didn't care). And what I made in private classes actually covered my rent each month, since my rent was cheap and I taught four classes a week. (If you're looking to do so, here's how I found my private classes). I love these girls, two of my private English students! 8. Was the Auxiliar stipend livable? Plenty? Too little? Yes, the auxiliar stipend is definitely livable. I found a place with significantly lower rent than most in Madrid, but even paying a higher rent price, there's still plenty to spend each month, and room to save for travel/loans/etc. This obviously depends on your lifestyle - if you eat out every day and blow a lot of money going out every weekend, you're not going to have as much. (Here's a rough breakdown of where I think my money went). I know you wanted numbers, but I'm going to give you words instead! I think my level of Spanish may have actually been the highest at the end of my study abroad year, and that's because my classes every day were taught in Spanish, and I read and wrote in Spanish when doing homework/classwork. When I worked as an auxiliar, I was speaking in English most of the time because that was my job! So keep in mind that since you'll be speaking and thinking in English during your auxiliar classes & preparations and private lessons & planning. Thus, in order to improve your Spanish, every moment outside of class you should be speaking and thinking in Spanish (theoretically)! Watch Spanish TV. Read Spanish news. Speak in Spanish at home and with your friends. Here are some more tips to get better at Spanish. Just by living in Spain, your Spanish will improve. But the amount you improve obviously depends on the situations you create for yourself. Back before the internet when my study abroad advisor studied abroad herself as a student, she became completely fluent during the year -- such a high level of Spanish. And that's because she was speaking and thinking in Spanish all the time. She wasn't reading English websites or Facebook or writing English emails, or skyping with friends in English. So obviously the more immersed you are, the more you'll learn and improve. 10. Were you able to travel while you were in Spain? What was your favorite destination? Yes - there is time to travel! Since you only work four days a week, every weekend is a long weekend. There are lots of other random national holidays too, plus winter break. I think my favorite place in Spain (outside of Madrid) is Granada. For a beach weekend, I loved going to Málaga or Alicante. Barcelona was also a wonderful trip. I have been to many places in Spain, but still have never made it to Galicia or Asturias (or many other places!). There is so much to see within Spain. 11. Were you able to sufficiently experience Spanish culture? 12. What was the most frustrating aspect of the Auxiliares de conversacion program and/or the Spanish government? One part I didn't like is that all of the communication was through email. The first orientation really didn't orient us into the program (I felt), so had I needed to get in contact with someone for any reason, I didn't know who to contact or the best way to do so. (Most of the emails we got say "do not reply to this email address") at the bottom. 13. What advice do you have to make these frustrations go more smoothly? Just knowing to expect some frustrations should help. Be flexible, and realize that this is how the Spanish government/offices are for Spaniards, too. Take it as a cultural lesson, and a great lesson in patience! The other part to remember is that it's only for 8-9 months. If I were going to live in Spain forever, I'd have to do some thinking, but it's not too much to put up with for the things you'll need to do during those 9 months. Remember that tons of other native English speakers have all gone through the same program and they get their NIEs and they get paid. Now that it's been some time since I worked as an auxiliar, I only really remember the good parts. Whatever frustrations I may have felt were all temporary and resolved. 14. Considering your entire experience in Spain overall, would you recommend that an interested person participate in the Auxiliares de Conversacion program? Basically, was it worth it? Definitely! You will have experiences that will last you a lifetime. The Spanish culture/lifestyle is so great! The country is diverse and exciting to discover. Speaking Spanish is fun, and you will gain a great language skill. Worth it 100%! 15. What final advice would you give to a future Auxiliar? And what is the best way to prepare for the program and 8-9 months in Spain? Advice -- It sounds like you've already been reading blogs, which can give you a good idea of what to expect. But don't treat these as word of law, because your experience will be what you make of it. I've tried to leave advice here and there in the above questions. Work is only 16 hours a week, so make sure you get involved in something during the other hours. Whether it be teaching private lessons, joining a sports team, volunteering, going to intercambios, etc. - just don't sit at home! Whatever your interests/hobbies are, I'm sure you can find a way to get involved in Spain. Lots of people go off to different European countries every weekend, but don't forget about where you're living! Seeing and experiencing the local events and visiting other parts of Spain will better integrate you with Spanish culture. Lastly, apply! You can always decline when you get accepted, but I would just go ahead and apply so that you have the option. Have any more questions? Please leave a comment! Last month one of my third grade classes here in Korea reminded me of the fact that different languages have different sounds for animal noises. I reflected back to when I first learned that animals in Spanish made different sounds than in English, and how it was a real eye-opening moment. More small moments like that one accumulated during my first year abroad, which amounted to my "new perspective" of the world that I brought back with me - and have been building on ever since. So what do Spanish animals sound like?